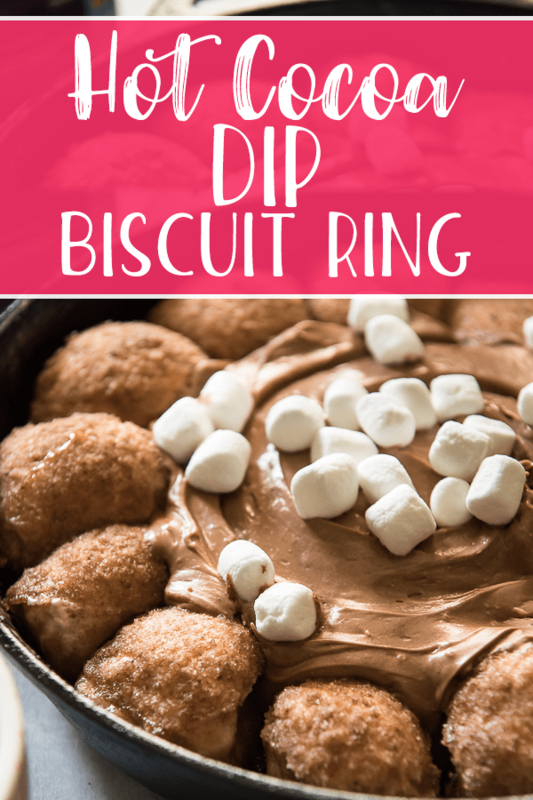 Turn your favorite winter beverage into a fun party food with this Hot Cocoa Dip Biscuit Ring! 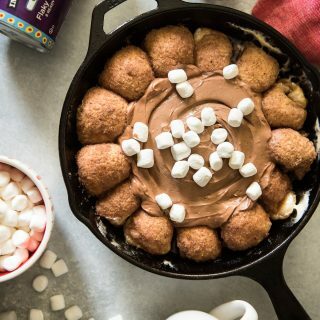 Serve up this hot cocoa-flavored cheesecake dip with buttery, marshmallow-stuffed biscuit balls for a snack everyone will be asking for! This post is sponsored by Immaculate Baking Co. All opinions stated are my own. Thank you for supporting the brands that make this blog possible! Is it dessert? Is it an appetizer? Or is it breakfast? 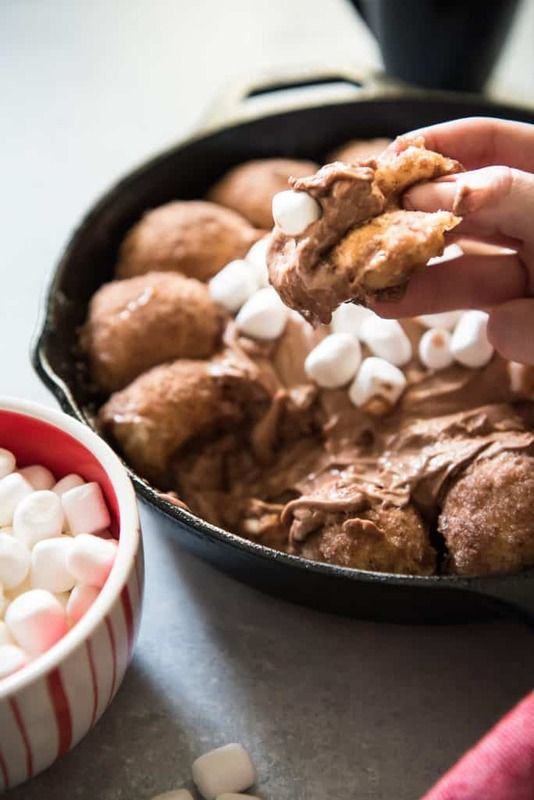 Biscuits totally mean breakfast in my world, so this hot cocoa dip would be perfectly acceptable to start your day with. 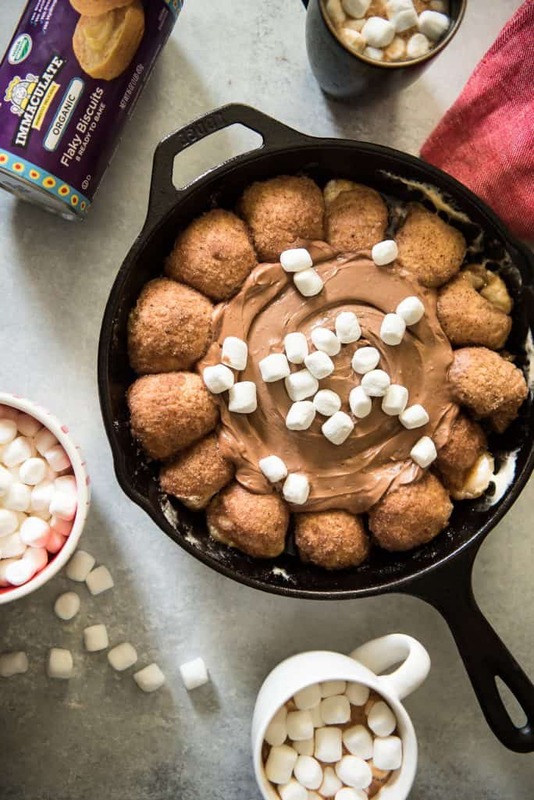 JUST TAKE ME TO THE HOT COCOA DIP BISCUIT RING ALREADY! If you’d rather skip my (pretty darn helpful) tips and tricks, essential cooking info, and similar recipe ideas – and get straight to this deliciously easy hot cocoa dip recipe, just scroll right on down to the bottom of the page where you can find the printable recipe card! For the record, these did not turn out the way I expected them to. So it turns out that when you bake a marshmallow inside a ball of biscuit dough, they melt. Not how you think – not all gooey and s’moresy and completely indulgent and messy. No, no. The marshmallow does melt…but into the dough. And leaves behind a big empty pocket of decadent air (which tastes better than you know,) and also keeps the biscuit all puffy. Canned biscuit dough is constantly in our fridge. When Abe can’t decide what he wants for breakfast on his days off, it’s usually bacon and egg biscuits, biscuit benedict, omelet sandwiches…you get the idea. We likey the biscuits. I used to always buy the generic brand biscuits, but when we tried the Organic Flaky Biscuits from Immaculate Baking, we knew we could never go back to the cheap stuff. 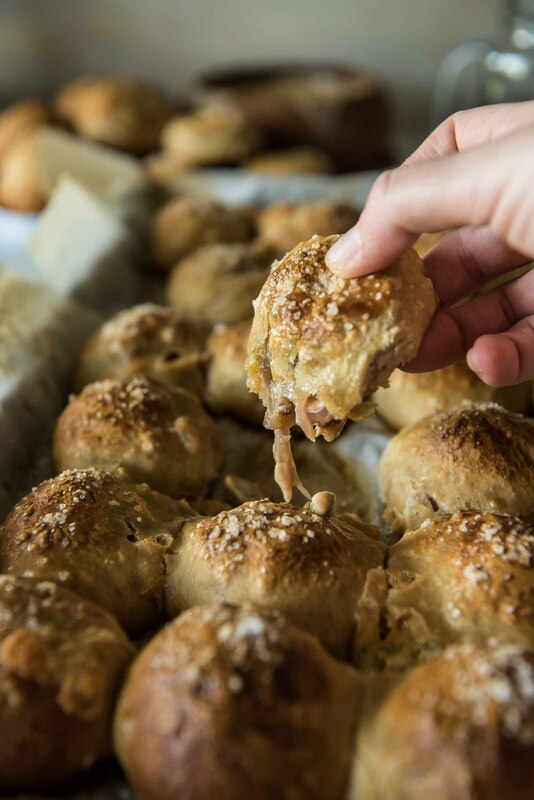 Not only are they huge, they bake up into the most picture perfect, flaky-layered little pillows of carby love ever. We love Immaculate Baking’s line of wholesome baking products. Even the line of gluten-free cookies are yummy – and that’s coming from a couple who really enjoys their gluten. Preheat oven to 350 degrees F. Grease an oven-safe 10-inch skillet with cooking spray. Cut each biscuit in half. Working with one half at a time, peel apart into two halves. Stretch and press each half into a thinner layer, then holding one half in the palm of your hand, press a large marshmallow into it. Top with the other half and pinch together until the marshmallow is completely sealed. Gently roll into balls. 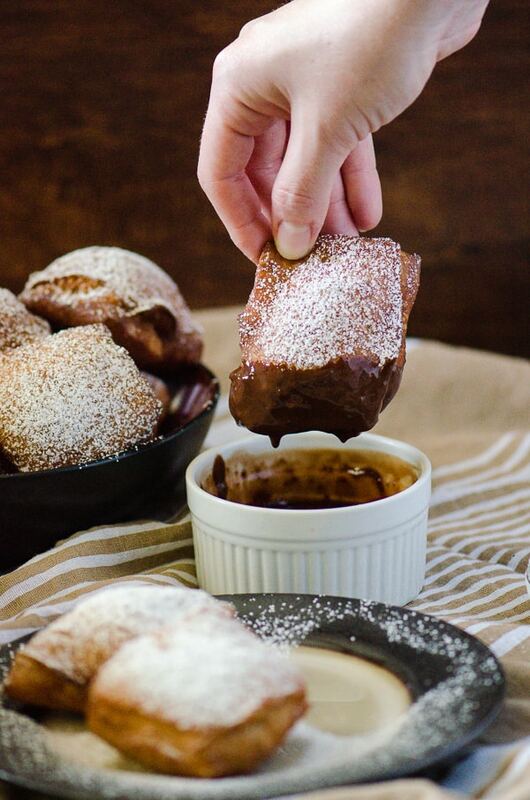 Dunk each ball in melted butter, then roll in the cocoa-sugar mixture. Place as many around the outside edge of the skillet as you can to form a ring. Bake 20-25 minutes, or until biscuits are golden and baked through. Let rest for 10 minutes. Combine cream cheese, Greek yogurt, and hot cocoa mix in a large bowl. Using a hand mixer, beat on low speed until cocoa mix is moistened, then on high speed until well combined and smooth. Using the spatula, fold the whipped cream into the mixture until fully combined. 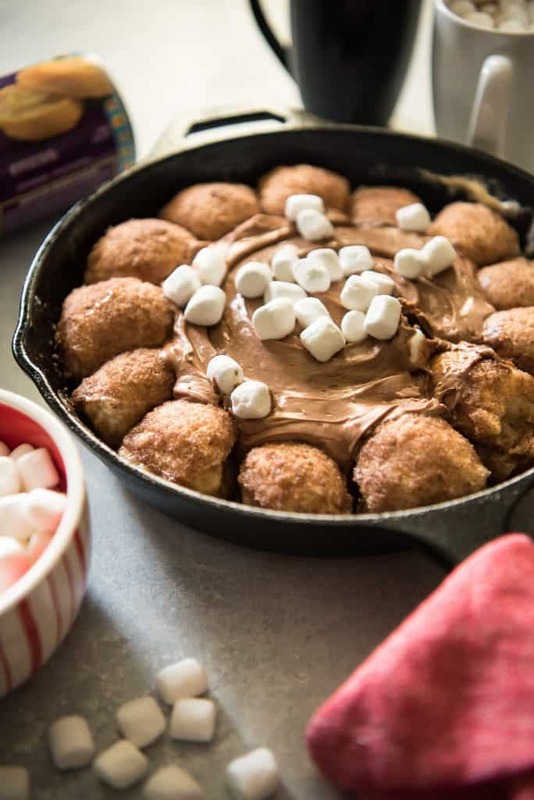 Transfer the hot cocoa dip into the center of the biscuits and sprinkle with mini marshmallows. Serve warm. 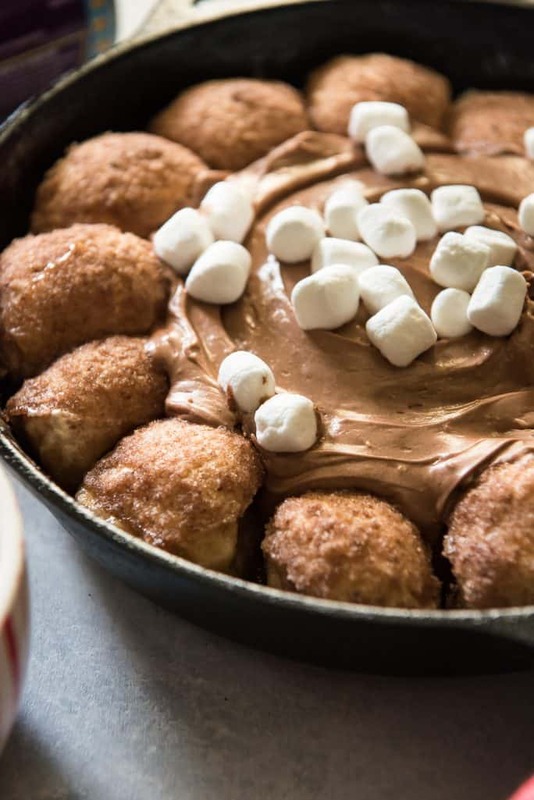 PIN THIS HOT COCOA DIP BISCUIT RING FOR LATER! So…you like to dip, huh? Here are a couple other snacks that are PERFECT for dipping-fiends like you! Yummm! I need you to make me a low carb version of this!